At 328 feet, the crane stands taller than the Statue of Liberty, plus has a lifting capacity of nearly 2000 tons. But what makes The Left Coast Lifter extra spectacular is that it operates by floating on a 384-foot barge powered by 3 diesel generators. The Left Coast Lifter departed it's home in San Francisco nearly a year ago for a long 6,000-mile journey through the Panama Canal and back up to New York City to work on the New Tappan Zee Bridge project. It will do the heaviest heavy lifting onsite—lifting that would be impossible for any other crane. 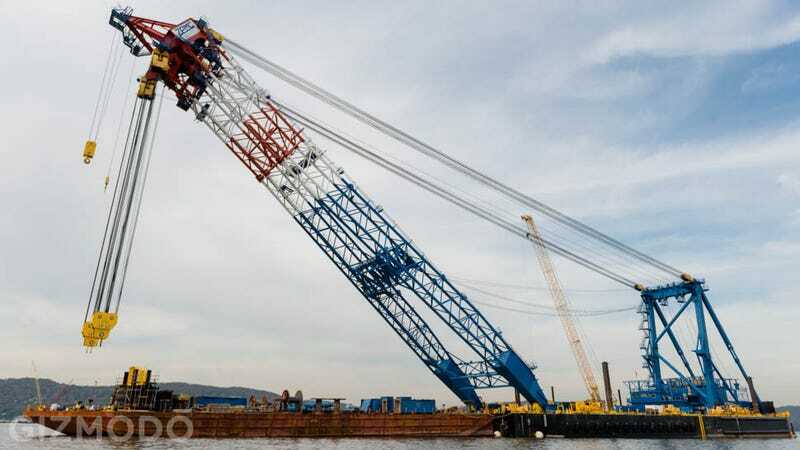 When the now-nicknamed "I Lift NY," supercrane finally arrived in Bayonne early last year, a process began to outfit the mammoth machine with whatever was needed for the work ahead at Tappan Zee. The whole barge and crane needed to be double and triple checked for any damages that could have been made along the trip. Pontoons that stabilize the crane during lifts were put back on, having been removed for transport. All lifting cables were replaced, and some final load tests were made. A crew of four crane operators were hired and trained for the five months before the move from Bayonne to the work site. This was more complicated than you might think. To get the crane properly docked onsite, the barge needed to be positioned on the far side of the Tappan Zee, which meant the tall machine had to somehow be floated underneath the bridge. Like other barges in New York Harbor, a tugboat was used to move the crane-carrying barge. But other, smaller, cranes wouldn't have had nearly as much trouble passing underneath the 138-foot clearance space the Tappan Zee Bridge allows for. To get the Left Coast Lifter through, however, the team had to flood the barges ballast tanks with two-million gallons of water and then wait until a very low tide. In order to even procure the crane for the New Tappan Zee Bridge project, builders had to plan out each lift the crane would do in advance, to prove it would be a financial advantage having the lifter onsite. According to the math, the massive crane proved to reduce construction costs by millions of dollars and shorten the effort by several months. When the "I Lift NY" is finally put into full operation, the machine will lift its planned loads with something called a VersaBar. This piece makes the crane capable of utilizing both of it's main blocks as one single lifting mechanism. With that, it can lift its maximum loads at a staggering slow pace of 50 feet per minute. On days where the load is exceptionally heavy it could take the entire work day to get a load lifted to the proper height. But there's still a lot more prep work that needs to be done before the first "big lift," as crane operator Ron Burgess calls it, to make sure the machine is really ready for the challenge. Until then, the less magnificent cranes and their crews will pick up the slack in order to meet the project's 2018 completion deadline. Interior crane photos courtesy of New York State Thruway Authority.